THE CHIQUI: AN EXTRAORDINARY URUGUAYAN. 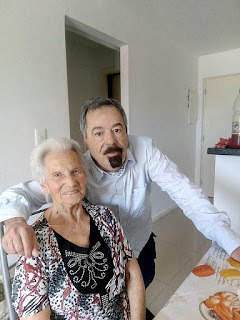 I met La Chiqui when she lived alone in a villa not far from Montevideo. She is the mother of my sister-in-law A ... already married to my brother W ... in Punta del Este. They invited me to her birthday. The villa was extensive and there was a lot of cultivation land and a large house with 4 rooms with two bathrooms where the Chiqui lived alone with its precious antique furniture, cabinets full of glasses of all colors and for different drinks and a large fireplace-fireplace marble where they fit like three men and that she lit with wood when it was very cold. Also on the farm there was something else, a little apart, which she rented to some very silent elderly people who did not get involved in her life. La Chiqui inherited all the land from her parents and, being very young, she married an emigrant from Italy, very masculine and serious but sweet with the children they had. When she talks about the husband she says "the deceased" and how loving he was. Between the two they planted vineyards they built small pieces where they stored the wine. There was a well connected to a spring from which they drew water for personal consumption and to irrigate all kinds of crops that grew strongly in that fertile land. They did not have to go to the market to buy vegetables. Everyone works the land and the mutual work, while the three children went to school. When the children came from school she forced them to take off their shoes at the entrance and put on some kind of flip flops so they would not dirty the nice floor. That was how obsessive the Chiqui was with cleaning. .When my mother and my brother came we took them to the Chiqui. She was already a person over 82 years old but erect and hardworking as if he were still young. .The banquet, as it were, a mixture of Italian and Uruguayan dishes and vegetables, tomatoes, ajís seasoned with a sauce that only the Chiqui knew the secret, devilishly delicious. And a hungry Mata-hambre-hungry kill- in churrasco with boiled eggs and roasted with milk, between two wooden plates tied with a rope to remove all the juices. Something only allowed to the Gods. And the cake, strawberry, apricot, peach and a lot of meringue that was the dish that completed the menu. All done days beforey by the Chiqui. Then we brought her to Punta del Este. We went to the Playa La Mansa. Mama Gloria with a towel robe and Chiqui guiding her towards the water - Mama only said she was blind when she needed a special care or attention, so all the time she was on the beach the Chiqui took care of her in the water, guided her steps and Gloria swollen with pleasure. Years passed and the Chiqui had problems of Hypertension and the beginning of Glaucoma. So the daughter got a buyer for the farm and rented a spacious apartment in Maldonado, where she would be closer to her daughter, my brother and me. I visit her every week and even though I tell her not to prepare lunch for me, she makes a giant "meriendita" with beets and mushrooms and takes the sweet out of the beet with a way of washing in warm water and then cold and then hot and so on ... and I gobble it up like an exotic delicacy, then a spinach pie, no flour-how can you do that? What a delight. And nobody talks about diseases or death. She is a widow of great faith, although without a rosary but with prayers when getting up and going to bed. And she loves red chorizos like my mother Gloria. They call him Chiqui because she's 1:50 in height. But it's pure sweetness and it gives me a lot of happiness. Chiqui that you live many more years.